From the gorgeous display to the ample storage, the Lenovo N300 is the perfect All-in- One desktop. This AIO runs on Android, but can also be installed with Microsoft Windows, and features a multi-touch display for tablet-like interaction. Plus, its integrated battery allows it to go cordless for a few hours for some in-home mobility action. The Lenovo Miix 3 is a tablet with the capabilities of a PC. Perfect for on-the- go business professionals, it boasts a quad-core processor, Office 365, In-Plane Switching (IPS) for vivid colors and ultra-wide, nearly 180-degree viewing angles. The Miix 3 offers all the connectivity needed with a Micro-SD slot, plus consumers can also add up to 64GB of external storage, giving plenty of space for movies, music, and work files. The ultra-portable, multimedia-rich tablet that’s perfect for budget-conscious is now made more affordable for on-the- go consumers through this sale event. The Lenovo TAB 2 A7-30 delivers a vivid, colorful viewing experience thanks to its IPS display and its infinity screen. Weighing just 269g and at 8.9mm thin, the TAB 2 A7-30 is perfect for reading, listening to music, watching videos, or surfing the web. 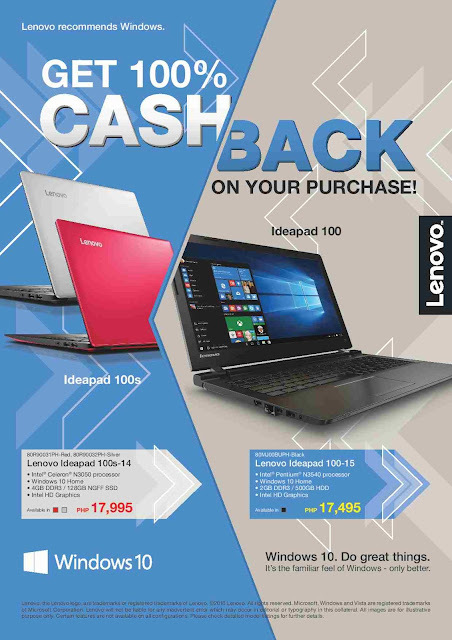 *The ADP comes with the Lenovo product bought from Lenovo stores and distributors nationwide. *Note to editors: The Lenovo ADP is only applicable to newly bought Lenovo products.